First of all I have to thank you all for the beautiful caring comments you left on my previous post. When I first started blogging I had no idea of the supportive, caring community the blogging world is. I really hope that in some way my story will help some one else going through a similar experience. It always feel better if you know you are not the only one out there! Now, moving right along . . . 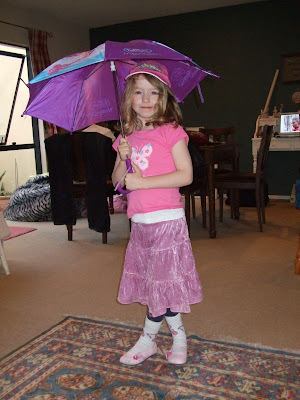 The other night The Princess put on an impromptu fashion parade for us. Isn't she just so very divine. 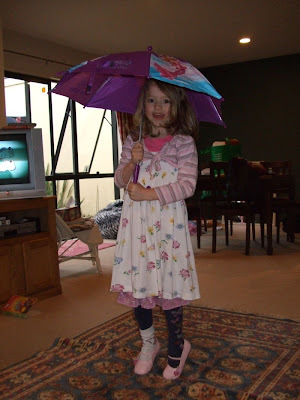 I love the way she co-ordinates her outfits and her perfect poses! 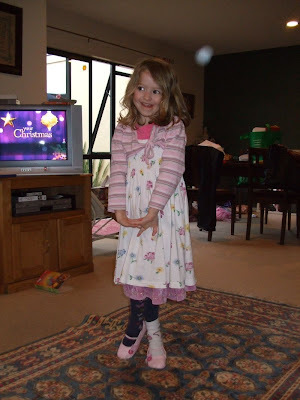 This photo is gorgeous, she wants to be a ballerina and is trying to stand on her toes! 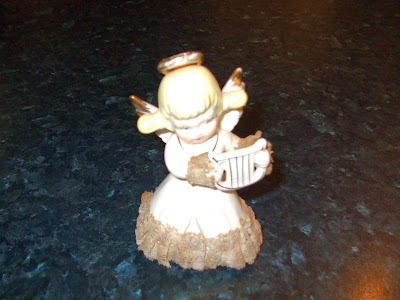 Thrifting has had slim pickings lately but I did pick up this little vintage china angel. She is so sweet. Sorry about my bad photography, I took a 100 photo's of her (slight exaggeration) and this is about the best I can do! 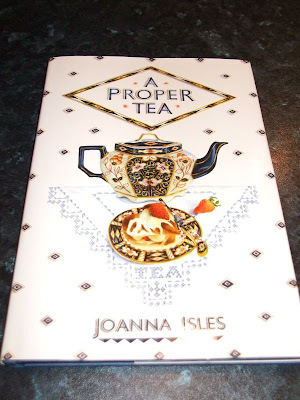 I also got this book titled 'A Proper Tea' by Joanna Isles. 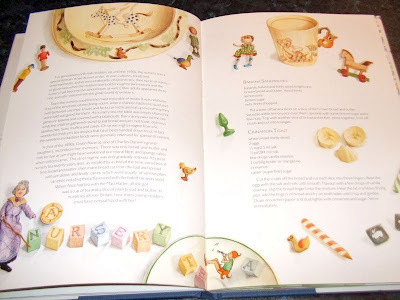 Its wonderful, a must for tea lovers! And it has the most fabulous illustrations. 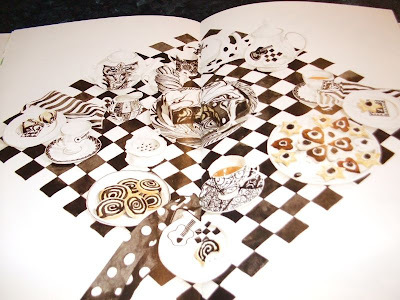 Such as this black and white themed tea party. And look at the beautiful nursery tea page. I have been feeling like I haven't been achieving that much over the last couple of weeks but when I look back I have actually made some progress. Finished my goodies for the Artful Christmas Swap I am part of. 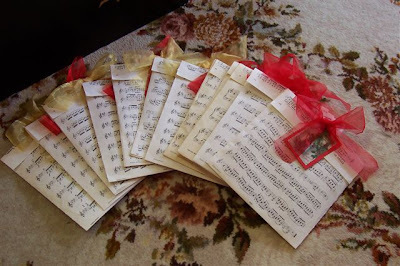 I made bags from sheet music to wrap my gifts in. The bags are actually better than the gift! Sadly I lost the plot with this swap, but I did finish it so ACHIEVEMENT! 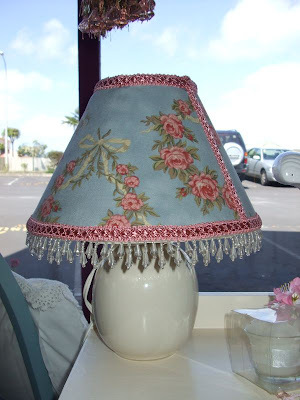 Here's another lampshade I recovered. I sold the last one. This is really pretty and again very subtle on the decorations. I have found that subtle sells better as far as lampshades go. I know I should do something with the base like paint roses on it but I am still not confident enough about my rose painting ability! I also changed the shop window, well I had to didn't I? The last one was Halloween! 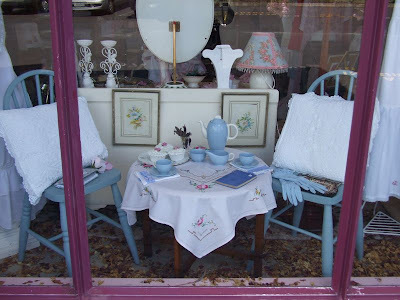 Anyway, I have gone for a blue and white vintage tea party theme! It looks really nice if I do say so myself! Can you see Natasha's cup cakes, they are for display only but they have generated a bit of interest! Yesterday I painted a new sign to stand out on the roadside. 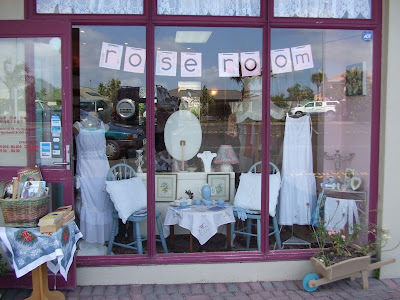 Now like I said, I am not very good at painting roses but I wanted something on my sign that made people look. So . . . I shamelessly copied a spray of roses from one of Natasha's hand painted signs. I hope you don't mind Natasha. I am teaching myself to paint roses but need to copy from something at the moment until I get my technique right and can branch out on my own!! 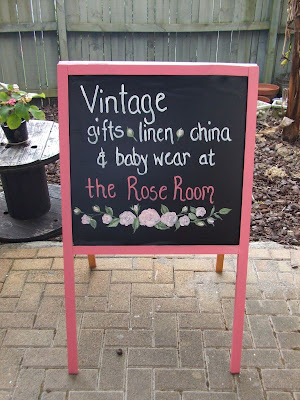 I think my sign looks ok and the roses look ok . . . from a distance! Not that flash close up but good enough to catch the attention of speeding cars!!! I am having a shop Christmas party on 25 November and am madly creating so I have new Christmas stock to sell. You should see the downstairs of my house, its trashed! 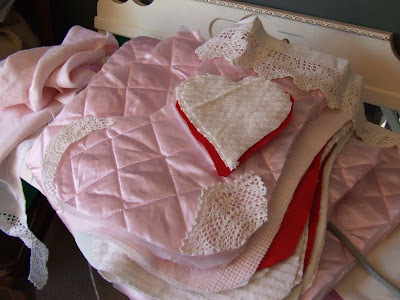 Here is a corner of the dining room and the ironing board piled high with cut out stockings, hearts and bags, all ready to be stitched. Now all I have to do is get the sewing machine out!!! And as for the dining room table . . . Heather, I hear what you are saying!!!! Oh and don't forget to comment all through November to win the Vintage Tapestry Evening Bag. Oh, oh, that's right, I am going to a prom!! I've never been to one so I am very excited!!! You can come to if you want, its on 20 November and Natasha is hosting it.